This dress is also from when my cousin and I were drawing together, so I didn’t really have a plan for it, I was just playing around with the different greens. (I didn’t really intend on scanning these, but I ended up liking them so much that I just had to.) It seems to me kind of like Evil Fairy Queen goes to the prom. I’m sure she would spike the punch and turn girls with prettier dresses into tadpoles, and heaven help those who danced with her and those who turned down a dance with her alike. wow i really love this – it’s so gorgeous! It’s so green. I like it. The fish-net underneath the skirt looks so nice. It is very nice. I too like the fish-net. This is awesome! So pretty, so gorgeous! I am going to print it RIGHT away!!!!! I am absolutely LOVING this dress! Can you please do a gown with a train next? Thank you for your lovely designs! Lovley dress.I can see Marilyn Monroe in it. 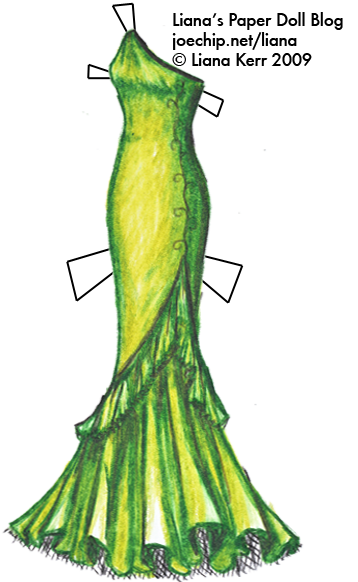 i’ve so been looking for a green mermaid dress..my bday is in march 13 and i’ve been looking for a nice green dress and this is perfect..i so wish i could purchase one for me…dang it. This is the dress I fell In love with !